Patentology recently contributed a long piece to IAM Magazine entitled ‘Apple vs Android – The Struggle for IP Supremacy in the Mobile Market’, which was published as the cover story of issue no. 52, March/April 2012. We published an edited extract back in February as Apple vs Android – IP Supremacy and the Mobile Market, while some early results of the patent landscape mapping ultimately used in the article were previewed in How Apple Punches Above Its Weight in Smartphone Disputes in November 2011. With issue no. 53 of IAM Magazine now on the shelves, we are free of our undertaking not to republish the full article. We are therefore pleased to present the complete piece for readers of the Patentology blog. Due to its length, we will be publishing it in five parts. In this first part, we look at the present state of the complex relationship between Apple and Samsung: bitter rivals in the courts on one hand, multi-billion dollar supplier and customer on the other. In the 1983 film War Games a teenage computer whiz – played by a young Matthew Broderick – inadvertently sets the world on a path to Armageddon when he hacks into a top-secret military supercomputer and challenges it to a game of “Global Thermonuclear War”. 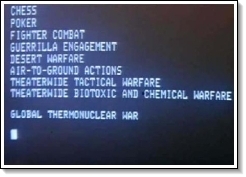 Fortunately, the computer – named “Joshua” by its creator – is equipped with cutting-edge artificial intelligence, programmed to develop improved battle strategy by repeated simulation. When directed to play tic-tac-toe against itself, Joshua discovers that the game cannot be won by either player and, by extending the principle to the nuclear war scenarios that it has devised, learns the concepts of futility and mutually assured destruction (MAD). Disaster is averted and the world returns to the status quo of the Cold War standoff. In the year that War Games was released, Steve Jobs turned 28. He had already become a multi-millionaire at the age of 25, when Apple Computer Inc (as it then was) went public in December 1980 on the back of having effectively launched the personal computer revolution with the Apple II. Also in January 1983, Apple launched the Lisa – featuring a graphical user interface (GUI) based on a desktop metaphor – and though this machine would have limited commercial success, due to its high price tag, Jobs was already leading the team at Apple which was working on something called the Macintosh project. Of course, the resulting product would go on, once again, to revolutionise the way that humans interacted with computers. So it would be understandable that Jobs might not have had much time for the movies that year. As a child of the Cold War, who grew up in the 1960s and 1970s and was strongly influenced by Zen Buddhism (he went on a spiritual journey to India in 1974), it seems likely that Jobs would have found that some of the themes of War Games resonated strongly with him. But by all accounts he had a complex personality, and he would probably have seen no irony or contradiction in his angry pronouncement to his biographer, Walter Isaacson, in 2010 that he was willing to “go thermonuclear war” on Google’s Android operating system, and “to spend every penny of Apple’s $40 billion in the bank”, if necessary. When Jobs uttered those words Apple had not, in fact, directly attacked Google. Nor has it done so to this day. Instead, that role has fallen to Oracle America Inc, which is using claims of copyright infringement, along with various patents relating to the Java platform which it acquired in its January 2010 purchase of Sun Microsystems Inc, in a US lawsuit against Google, filed in August 2010. Apple’s first strike against Android consisted of two complaints, filed in March 2010 in the US District Court for the District of Delaware and with the US International Trade Commission (ITC), alleging infringement of 20 Apple patents relating to the iPhone’s user interface, underlying architecture and hardware by Taiwanese smartphone manufacturer HTC Corporation. Since then, the face-off between Apple and its best-performing Android-based competitors has escalated. In October 2010 Motorola Mobility Inc pre-emptively struck at Apple, using 18 of its US patents, in three different venues, followed closely by an attack on the validity and relevance of 12 Apple patents in a fourth venue. Apple initially fought back with six of its own patents, none of which was among the 12 under attack by Motorola. By December 2010 the dispute had coalesced into litigation over infringement and validity of 24 Apple patents, and 18 Motorola patents, across the ITC and the US District Courts of Delaware, the Western District of Wisconsin and the Southern District of Florida. Meanwhile, behind the scenes, Apple had been in negotiations with a company with which it has a far more complex relationship. When Apple wanted more control over the characteristics of the processors used in its mobile devices, including the iPad and subsequent iPhone models, it abandoned plans to base a tablet computer on Intel’s Atom chip and instead acquired a 150-person microprocessor design firm to develop a custom system-ona- chip integrating an ARM processor core, graphics, operating system and memory controller, which it called the A4. And it chose Korea’s Samsung Electronics Co Ltd – the world’s largest semiconductor manufacturer – to produce the chip. Every new iPhone and iPad now sold contains either an A4 or the newer dual-core A5 processor manufactured for Apple by Samsung. While recent reports suggest that Apple may have reduced its dependence on Samsung memory chips and be seeking alternative suppliers for its processors, it is unlikely that other manufacturers will be able to meet Apple’s volume requirements for the foreseeable future. While Samsung was therefore one of Apple’s largest and most important suppliers, it had also become a serious competitor in the mobile devices market. Along with some of HTC’s Android-based smartphones, Samsung’s Galaxy S handset was being favourably compared to the iPhone, while the Galaxy Tab 10.1 tablet computer was generating buzz even before release with its technical specifications – a 10-inch widescreen-format display, dualcore processor, with decent performance and battery life from its implementation of the latest tablet-specific Honeycomb variant of the Android operating system. Moreover, without a cover the device is both lighter and thinner than the iPad 2. Some information regarding negotiations between Apple and Samsung, which commenced in the latter half of 2010, has emerged through recent court hearings, although many details of commercial dealings have been discussed only in closed courtrooms and corresponding portions of published judgments have been redacted. What is known is that, in view of the companies’ relationship, Apple was at least willing to discuss possible patent licences with Samsung, but that this would most likely be limited to “lower level patents”. Apple, it seems, was standing by its claims that Samsung was “slavishly copying” its products, and was determined that it would not tolerate this. On 15th April 2011, Apple filed suit against Samsung in the US District Court for the Northern District of California, alleging infringement of various utility and design patents, trade dress and trademarks by a range of products, including various Samsung smartphones and the Galaxy Tab tablet. This was rapidly followed by lawsuits in Germany, the Netherlands and Australia. Indeed, by mid-August 2011 Apple and Samsung were additionally engaged in IP litigation in the United Kingdom, France, Italy, Japan and South Korea. Further, Apple had some early successes, with injunctions being granted in Germany, the Netherlands and Australia, leaving Samsung looking very much like it had been caught off-guard and forced onto the back foot by the timing and intensity of Apple’s assault. In Part II we will look at Apple's history with Microsoft, and the two companies' battle for control of the desktop.